The groundbreaking ceremony for the Women in Military Service for America Memorial was held June 22 at the main entrance to Arlington National Cemetery outside Washington D.C. I was one of 5500 there to listen to President Clinton and 15 other speakers. This was the largest single gathering of military women in our nation's history. The short, interesting and well-presented speeches kept the 90-minute ceremony moving rapidly. The speaker who seemed to be enjoyed the most was 94-year-old Anne Pedersen Freeman, a World War I veteran. She joined the Navy when she graduated from high school in 1918, and was assigned to the Brooklyn Navy Yard. She stated, "I don't remember exactly what we did but we typed, typed, and typed and made six copies of everything." She is pleased to see the opportunities grow for women to serve their country: "When I served, women didn't have the right to vote." Another World War I veteran, 95-year-old Helen Coxhead, showed off her dog tags inscribed with her enlistment date of June 28, 1918. She said, "I have carried my original Navy dog tags with me each day since for 77 years. They have become a real gem to me." I identified with Major General Carol Mutter, who grew up on a farm, graduated from a high school the size of Clear Lake's, and went to college to become a schoolteacher. She now wears two stars and is the senior woman on active duty in the Armed Forces. She has been in the Marine Corps for 28 years. Of military women, she says, "The vast majority, like me, are women from ordinary backgrounds who have been given the opportunity to do some extraordinary things by serving in the military." President Clinton followed General Mutter. He said women for too long were treated like second-class soldiers. "They could give their lives for liberty, but they couldn't give orders to men. "They could heal the wounded and hold the dying, but they could not dream of holding the highest ranks. They could take on the toughest assignments, but the could not take up arms. Still, they volunteered, fighting for freedom all around the world, but also fighting for the right to serve to the fullest of their potential." The fight for a symbol of recognition began in 1985 when legislation to authorize a memorial was introduced in Congress. President Reagan signed the law on November 6, 1986. The Women in Military Service for America (WIMSA) Foundation was established, with retired Air Force Brigadier General Wilma Vaught elected as president. 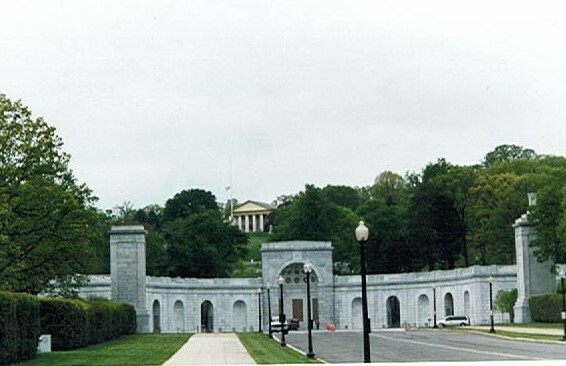 The Memorial will be built upon an existing 30-foot-high semi-circular granite wall, which was dedicated in 1932 with the intention of being Arlington National Cemetery's "grand entrance." It was never completed, and has been neglected for years. The wall will be restored and a reflecting pool placed in front of it on the lower terrace. Four stairways that represent "breaking through the barriers" will lead to the upper terrace. Glass tablets, inscribed with quotations from military women, will frame the upper terrace. They will light up the cemetery hillside at night and serve as skylights for the Education Center. A 35,000-square-foot underground facility behind the wall will house the Education Center, with a conference center, 196-seat auditorium, Hall of Honor and exhibit gallery. The heart of the Memorial will be the Computer Register, a database of women who served in the military. Their photographs and memories can be viewed by typing their names into the computer. The law required the money for building the Memorial be raised before construction began. Congress appropriated $9,500,000 for repair and restoration of the existing wall. The governments of Saudi Arabia and Kuwait each donated $850,000 in commemoration of the women who served in the Gulf War. When WIMSA fundraising efforts brought the total to $15,300,000, plans for construction were allowed to proceed. That amount includes a $2,300,000 line of credit from NationsBank, which will become a regular loan if it has to be used. At a celebration dinner after the groundbreaking, AT&T presented a check for $1 million, the largest single contribution to date. Construction is expected to begin early next year, with the dedication in late fall of 1997 or spring of 1998. General Vaught told me, "The next two years are going to be exciting and pressure-filled as we hire contractors, start building, decide on our exhibits, work on the Computer Register and do the myriad of tasks that must be done. "I hope the South Dakota veterans start planning now to be with us on Dedication Day. It will be truly memorable." An estimated 1.8 million women have served in the U.S. military from the American Revolution to the present. South Dakota has 3000 of them. WIMSA has collected 125,000 names and histories for its computer database. Because of privacy considerations and missing records, the military services and the Department of Veterans Affairs cannot provide veterans' names and addresses. WIMSA is relying on friends, family and word of mouth to locate more women. Its goal is to have 500,000 in the database when the memorial is dedicated. WIMSA's registration brochure says it well: "We've all grown up with the expression, 'a few good men.' The Women in Military Service for America Memorial will be the first major national memorial to recognize that there have been more than a few good women serving right alongside."